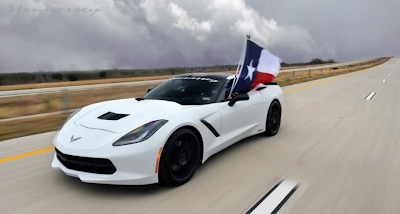 Well, you can wait for the future Z06 and ZR1 versions, or you can simply go to Hennessey in Texas and ask for a tune. The famous tuner has pumped up the C7 with the use of a new supercharger and with the addition of a 100 HP Nitrous Express kit. The result? A 700hp muscle which is able to reach 200mph (322 kph), by making it the fastest C7 on the market and the first to break this barrier! its only a 5 speed ? I love this colour,it is pure and divine.